In 2015’s United States of America, a white police officer that does NOT shoot and kill a black motorist is considered a hero. In recent mainstream media (MSM) reports a white police officer named Matt Okes is being praised as a “hero” for not brutalizing or killing a young black male, Joseph Owusu, who was pulled over to the side of a road due to a flat tire. 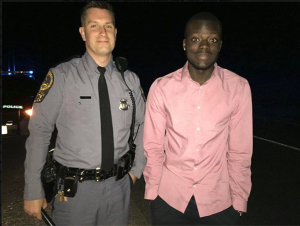 Joseph, a Virginia Tech University student and son of Doctor Nada Owusu, has become famous overnight for not becoming the next victim of police murder.